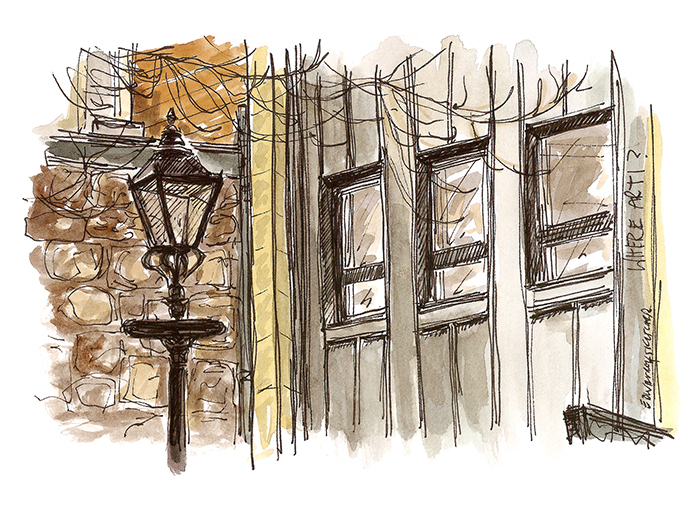 Morning Edinburgh, do you recognise my sketch this week? If so let me know below for the chance to earn points on the leader board. The WhereArtI competition goes live every Monday morning at 8am, I sketch a location in Edinburgh, you tell me where I am. On the first Monday of each month however, the sketch could be anywhere in Scotland. There are points on offer for the first three correct answers, with a prize to who tops the leader board at the end of the year. Good luck every one! Keep an eye on the facebook and twitter throughout the day for clues if they are needed. Answer to come before Tuesday morning. This is actually drawn from Roxburgh’s Court, but I will also accept Advocates Close and features The Old Town Chambers Hotel. The first three correct answers were 0apropos, Dunedinhen and G Bower. Thanks for playing along, more next week. I’ve changed my mind, I’m going for Roxburgh’s Court. I’m going to go with Boswell’s Court, although the modern windows are confusing me too. This ‘five star’ court is hidden from the High Street, accessed by a narrow close. OK, so for the sake of future websearches that lead here, let’s call it Roxburgh and Warriston Close also. Makes me think of the Flodden Wall next to the Vennel. But where did the modern building come from? It was a car park the last time I looked.